How Should We Respond To High In-Demand Skills? I find it interesting how we respond to publications related to top in-demand skills needed to be successful. 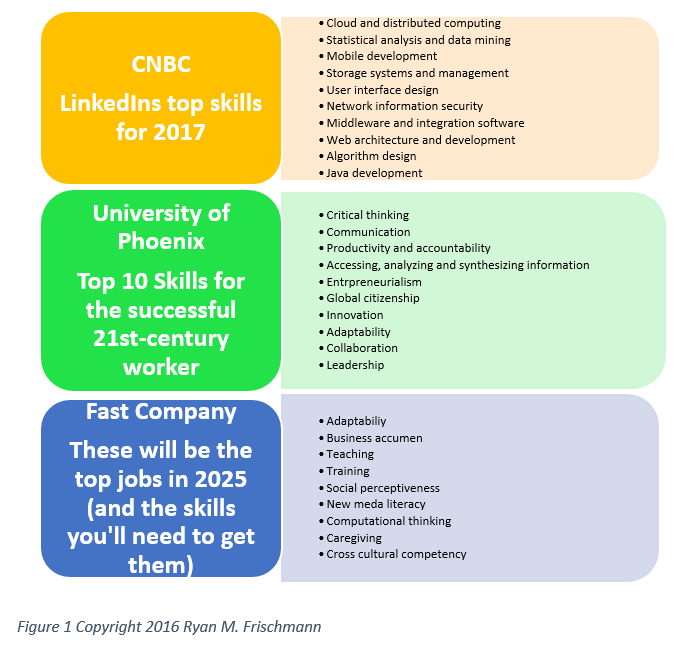 I immediately think: Should we target acquiring the necessary skill competencies directly? Should we simply assume going to college gets me the skills? No, I think we should create ‘learning plans’ where learning is defined in skills and their underlying methods and applications. A pair of Gallup surveys published in 2014 identified employers as saying: (1) college graduates do not have the skills businesses need; (2) and applied skill and knowledge are more important than a college degree and its pedigree. And perhaps in response, per the World Economic Forum ‘The Future of Jobs Report’, twenty-five percent of the respondents (senior talent and strategy executive) say they will ‘collaborate (with) education institutions’ as part of their future workforce strategy. I think skills should be one big aspect of ‘learning paths’. These paths might be part of or a complete four-year degree. Some colleges are moving in this direction by implementing Competency Based Learning (“CBL”) programs; a TechCrunch article says colleges offering CBL has grown from 50 to 500 programs this year. Generally, the concept behind a CBL program is to allow students to work at their own pace and replace credit hours (seat time) with competency levels. So, when they pass a test or project, they get credit and move on. Learning paths might include micro-credentialism, fast, efficient, and direct paths to acquire employability skills. Some types of these programs include: bootcamps, apprenticeships, credential or license programs, etc. I think learning paths should be: self-directed, personalized and adaptive, linked to employability, sequential for continued growth, and based on skills and underlying methods and applications. There should be a stage when a student takes on the responsibility for their learning. I do not suggest changing required courses in high school or a college degree. And I also think parents, mentors, teachers, and counselors should have varying roles in providing necessary guidance. One example of this (and a benefit in Common Core, a standardized and accessible list of standards) is playing an educational game by Sim City for extended learning outside of the classroom. I have created a platform to compare and summarize learning expectations of education resources called Skills Label℠ , which has cross integration functionality with Skills Based Approach℠. In a Pew Research survey, seventy-two percent of American adult workers say “a lot” of responsibility falls on individuals to make sure that they have the right skills and education. So, the question becomes at what age should a person take ‘driver’s education’ and later the ‘driver’s seat’ of their learning. Underperforming students find other learning resources, perhaps in other media to reach a desired competency. They might also get a more intense learning experience for needed skills. Students in the ‘middle of the curve’ get the standard learning plan and then modify it to accommodate their needs. The real benefit in this category is with the motivated students. They choose how much time to dedicate to learning. An average student who spends significant time learning a skill set gets employed faster and competes with less focused students who have more ability. High performing students need to keep moving forward with their learning. A seat time model makes less sense for these students. They become bored and distracted in the classroom. For these students, it is about finding and putting them on their career track so they can start contributing with their brilliance. Making contributions in higher order skilled professions take years of preparation. Learning paths should link to employability. Students want contingencies after completing their learning plan. They can think: ‘If I take these courses or pass this certification, I will be employed with this career making a salary in this range’. Lifelong learning is a requirement for most professions. According to Pew Research’s survey The State of American Jobs, fifty-four and thirty-three percent of worker say ‘training/ skill development throughout their work’ will be ‘essential’ and ‘important, but not essential’ respectively. Learning plans should have continuity, so students and professionals are always working on their skills throughout their lifetime. This might involve working on the ‘depth of their skills’, where you take a few skills and keep getting better at them – become a master. This might involve working on the ‘breadth of their skills’, where you keep adding new skills to your skill set. Working with underlying methods and applications of a skill is one level deeper than what is typically in practice. (My interpretation of the relationship is: skills are like atoms and the methods and applications are like sub-atomic particles.) Anyways, I think with ‘learning paths’ it is worth understanding the methods behind applying the skill. Use logic for appropriate inferences. Hear, and process conflicting ideas. Thinking precisely with methods and techniques makes acquiring skills adaptive to rapidly changing technologies. For example, with the technical skill of ‘Database Design’, I might use the entrenched SQL relational database design or the upcoming NOSQL flat, ‘big data’ structure. Skills-Based Approach is a methodology centered on the development of a skill set throughout a lifetime. There are ways users can create their own ‘learning plans’ within the application. It is possible to merge traditional learning programs with newer ones based on acquiring skill competencies.